This tutorial demonstrates how to use the Azure Blob Service. In [[Windows Azure and SQL DatabaseTutorials - Tutorial 1: Using Windows Azure Web Role and Windows Azure Table Service|tutorial 1]], you created a simple golfer message board application. 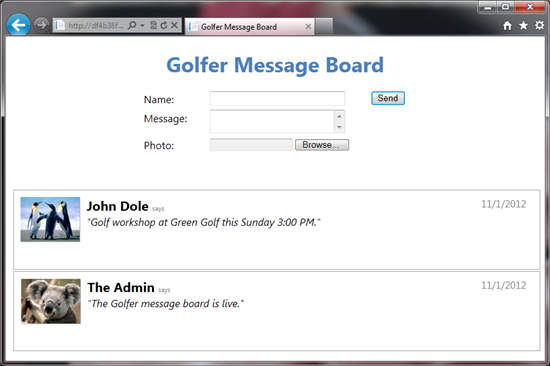 In the application, a Web role provides the front-end that allows golfers to view the contents of the message board and add new entries. Each entry contains a name and a message. When golfers post a new message, the Web role creates an entry using the Table service that contains the information entered by the golfers. The Web role also renders this information to the browser so golfers can view the content of the message board. Tutorial 3 is based on tutorial 1. 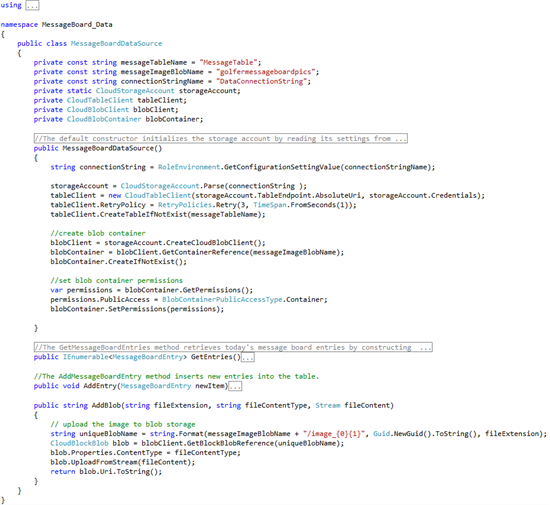 In this tutorial, you will modify the application you created in tutorial 1. In addition to golfer name and a short message for each message ported to the message board, you will also add an image. You will keep using the Table service for the text portion of the messages, but use the Blob service for images. Note: Completing tutorial 1 is not a pre-requisite for this tutorial. However, it helps with understanding the scenario. A service hosted in Windows Azure consists of one or more Web roles and worker roles. A Web role is an ASP.NET Web application accessible via an HTTP or HTTPS endpoint and is commonly the front-end for an application. A worker role is a role that is useful for generalized development, and may perform background processing for a Web role. The Tutorial 3 application contains a Web role project. For more information, see Overview of a Windows Azure Application at http://msdn.microsoft.com/en-us/library/gg432976.aspx. The Windows Azure Blob service enables applications to store large objects, up to 1TB each. It supports a massively scalable blob system via the Windows Azure CDN, where hot blobs will be served from many servers to scale out and meet the traffic needs of your application. Furthermore, the system is highly available and durable. You can always access your data from anywhere at any time, and the data is replicated at least 3 times for durability. In addition, strong consistency is provided to ensure that the object is immediately accessible once it is added or updated; a subsequent read will immediately see the changes made from a previously committed write. An application must use a valid account to access Windows Azure Storage. An account can have many Blob containers. Each container provides a grouping of a set of blobs. 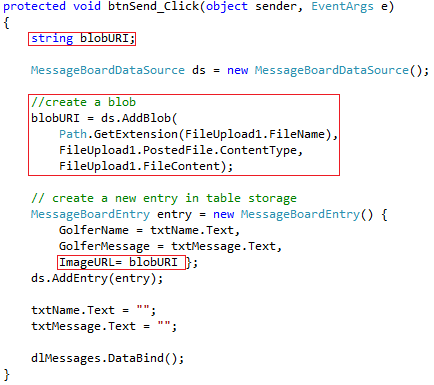 In this lesson, you modify the golfer message board application to use the Blob service for storing images. In File name, type C:\AzureTutorials\Tutorial3\GolferMessageBoard\GolferMessageBoard.sln, and the click Open. In [[Windows Azure and SQL DatabaseTutorials - Tutorial 1: Using Windows Azure Web Role and Windows Azure Table Service|tutorial 1]], you defined a fixed schema for the Table serivce to storage messages. You must modify the schema to include a new data member for storing the URL to the image in the Blob service. Note: All letters in a container name must be lowercase. For more restrictions on container names, see Naming Containers, Blobs, and Metadata. In Solution Explorer, right-click MessageBoard_Data, and then click Rebuild. Default.aspx presents the message board Web interface. You must modify the page so that golfers can upload an image, and the page can display images along with messages. See the screenshot at the beginning of the tutorial. Find the <div> tag with class=”inputSection”. At the end of the <dl> tag, add the code for uploading images by inserting the code snippet Tutorial03-Lesson01-Task03_WebRoleFileUpload. 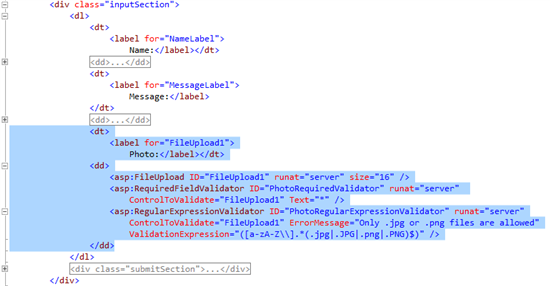 ControlToValidate="FileUpload1" ErrorMessage="Only .jpg or .png files are allowed"
If you don't see the code snippet, follow the instructions in Windows Azure and SQL Database Tutorials (en-US) to copy the code snippets. Next, you modify the default.aspx.cs for creating and using the Blob service. In the code, you define a lock to prevent the Blob service being created multiple times. In Solution Explorer, right-click MessageBoard_WebRole, and then click Rebuild. In this step, you introduced the Blob serivce to the golfer message board application. You will test the application and prepare the service package for the application. In this lesson, you test the application in the compute emulator environment, package the application, and then deploy the application to Windows Azure. Click Package. After Visual Studio builds the project and generates the service package, Windows Explorer opens with the current folder set to the location where the generated package is stored. The default directory is C:\AzureTutorials\Tutorial3\GolferMessageBoard\MessageBoard\bin\Release\app.publish. Make sure to write down the path. You will need it in the deployment lesson. The next step is to create a storage account for using Windows Azure table service and blob service. If you have created a storage account in [[Windows Azure and SQL DatabaseTutorials - Tutorial 1: Using Windows Azure Web Role and Windows Azure Table Service|tutorial 1]], you can skip this step. Once the storage account is created, click the storage account from the storage account list to select it, and then click MANAGE KEYS on the bottom of the page. When you create and test the application locally, the application is configured to use the development storage. Now you have created a storage account, you can configure the application to use the storage account before deploying the application to Windows Azure. The configuration information is in the ServiceConfiguration.Cloud.cscfg file. This file was created when you generated the service package. Use Notepad to open C:\AzureTutorials\Tutorial3\GolferMessageBoard\MessageBoard\bin\Release\app.publish\ServiceConfiguration.Cloud.cscfg. This path can be different if you installed the tutorial files into a different folder than the c root directory. Notice the value of DataConnectionString is "UseDevelopmentStorage=true". Wait until the upload process is completed. The process can take several minutes to complete. Notice the DEPLOYMENT NAME is changed to v1.2.0.0. Congratulations! You have completed tutorial 3. [[Windows Azure and SQL Database Tutorials - Tutorial 4: Using Windows Azure Worker Role and Windows Azure Queue Service|Tutorial 4]] shows you how to use another Windows Azure storage called Windows Azure Queue service.